Shopping for Power Rangers Prop Replicas? Morph into your favorite Power Ranger! The Morpher is made of quality die-cast metal and plastic. Includes zinc die-cast metal replicas of all 5 original TV show coins. 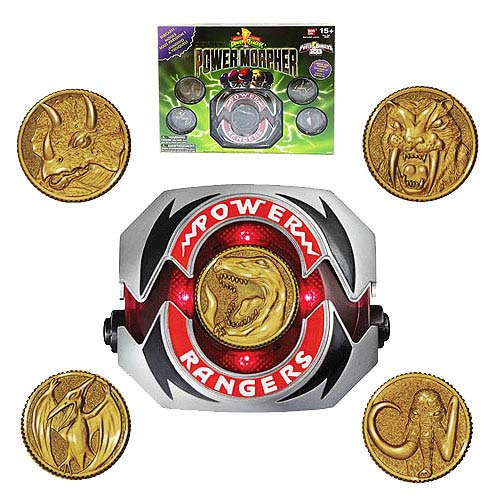 The coins activate Morphin' LED and sound effects! Morph into your favorite Power Ranger with this Mighty Morphin Power Rangers Legacy Edition Morpher! This replica of the Morpher is made of quality die-cast metal parts and plastic, and measures about 10-inches wide x 8-inches tall x 3-inches long. Zinc die-cast metal replicas of all 5 original TV show coins are included, with a bronze-like finish, and each coin activates Morphing LED and sound effects! The Morpher comes packaged in a window box boasting the 20th anniversary logo. If you were a kid in the 90s, "It's Morphin Time!" will elicit great memories of watching Mighty Morphin' Power Rangers after a day of school! Requires 2x "LR44" batteries, included. Ages 15 and up.